Zedoary is a perennial herb. This plant is native to India and Indonesia. The eatable root of zedoary has a white core and an aroma like the mango; however, its taste is more similar to ginger, except with a very bitter aftertaste. In Indonesia, it is ground to a powder and added to curry pastes, whereas in India, it tends to be used fresh or in pickling. 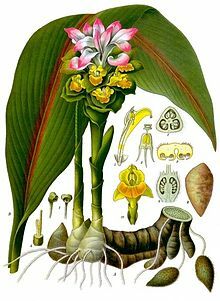 Zedoary is also used in some traditional eastern medicines. Zedoary has been used to treat coronary heart disease, liver cancer, anemia, chronic pelvic inflammation and helps prevent leukopenia due to cancer therapies. ↑ Dharmananda, Subhuti. "TURMERIC:WHAT'S IN AN HERB NAME? HOW TURMERIC (JIANGHUANG) AND CURCUMA (YUJIN) BECAME CONFUSED". Retrieved 10 November 2010. This page was last changed on 12 March 2013, at 12:37.